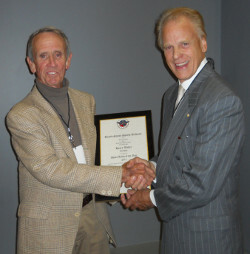 Harry Weber (left) receives the 2011 Sport Artist of the Year, Sculptor, Award from Trustee Jack Scharr. 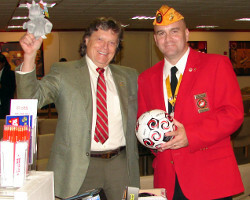 Harry Weber, recently named the 2011 American Sport Art Museum and Archives’ (ASAMA) Sport Artist of the Year, Sculptor, honored veterans who served their country with a special art exhibition on the United States Sports Academy’s campus Wednesday, 10 November. 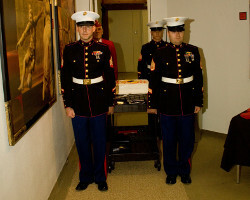 The Academy also honored the 235th birthday of the U.S. Marine Corps, while kicking off its annual campaign as a major drop-off point for Toys for Tots, with this exhibition. 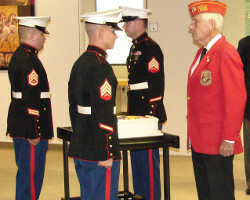 The Marines have recognized the Academy as one of the largest Toys for Tots collection sites in the region. 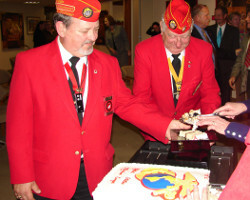 Weber displayed a series of sketches depicting scenes from the Korean War, Desert Storm, the Iraq War, and the War in Afghanistan in an exhibit entitled “A Warrior’s Sketchbook.” Weber presented the Academy with a bronze statue of a soldier holding up an American flag, entitled “Wounded Warrior.” This sculpture was donated in recognition of the Academy’s dedication to educating the nation’s wounded warriors. 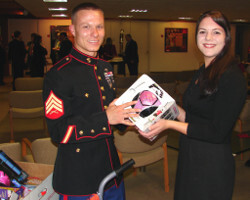 Weber donated the sketches featured in the art exhibit to ASAMA, and they are being sold with the proceeds going to the Academy’s Wounded Warrior scholarship program, which provides scholarships for those injured in the wars in Iraq and Afghanistan. 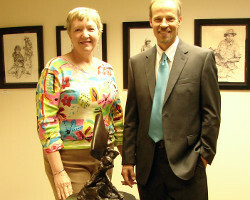 Weber was presented with the 2011 American Sport Art Museum and Archives (ASAMA) Sport Artist of the Year, Sculptor, Award by United States Sports Academy Trustee Jack Scharr at the Foundry Art Centre in St. Charles, Mo. on 22 October. Weber, a man who has had a busy decade decorating the country with bronze statues, was one of the featured guests at a gala celebrating the anniversary of the art centre, located in the St. Louis suburbs. The presenter, Scharr, is the president of Fine Art Ltd. and the Academy Trustees’ Chairman of ASAMA. The 21st century has been a busy time for Weber. Thirty-six out of 44 of his most noted works have been displayed at major venues over the last decade. This includes 10 statues displayed at the St. Louis Cardinals’ newest version of the Busch Stadium. The subject of one of those statues, former Cardinal player Ozzie Smith, was also a featured guest at the gala.